(13) soul-shaping books – walking forward. 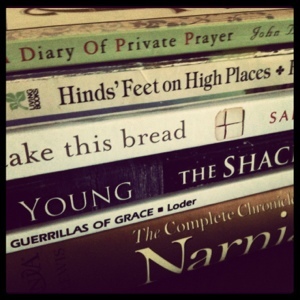 I was inspired by Sarah Bessey’s lists of “10 books” several weeks ago and since then have wanted to write about some of the books that have impacted me. I don’t know exactly what to call this list. Some of these books I haven’t read in years, others I’ve read recently or have been thinking of re-reading for months now. But when I perused my bookshelves and baskets a few minutes ago, these were the ones that stood out to me, books that have been soul-shaping, changing the way I perceive God, changing the way I perceive “reality,” and challenging the way I respond to and interact with the world and reality around me. On another day, this list might be different. But today, these are the soul-shaping books I remember. Hinds’ Feet on High Places by Hannah Hurnard was a Christmas gift from my parents when I was six years old, but the content and style was a bit advanced, even for a precociously advanced reader like little me, and I don’t think I read it through until I was about 10 years old. Hurnard’s classic and brazen allegory of Much-Afraid’s journey to the High Places with the Shepherd is one that I have been able to identify with on a raw level again and again in my own journey. Except I don’t think I’ve really reached the High Places yet. (I know, I know, it’s a journey, not a destination, blah, blah, blah). There are portions of this book that I have practically memorized and which come back to me like the whispers of the Spirit in opportune moments. A Diary of Private Prayer by John Baillie was also a gift, this time from my mom when I was 18. We’re so similar, she and I, and I think our souls often need similar watering and light for growth and expansion. As a forever PK and a sometimes tight-laced, rule-following religious person, I desperately need my mind blown open by mystics and Jesus-followers and seekers who are much more open, spread out, of broader perspective than I. John Baillie first published this book of morning and evening prayers in 1949, yet even in the 2000s, his prayers inspire my own prayers, broadening my awareness beyond myself, pushing me to acknowledge my weakness and God’s grace, challenging me to pray, pray, pray. I need to use this again. Guerrillas of Grace by Ted Loder. Published in 1984, this book of prayers reflects the conflicted era of its writing, but continues to resonate with me throughout the conflicted seasons of my life. I long to pray, to pray more, to pray better, to pray more fervently, with more integrity, with more love. Loder’s prayers have this deeply messy, human element that feels so right. I love that. And I’ve found that I love reading other peoples’ prayers and claiming them for my own. The Chronicles of Narnia by C. S. Lewis have been a part of my life since childhood when my parents read them out loud to us multiple times. They were reborn into my young adult life when my parents purchased Focus on the Family’s radio theater version, which is delightful and very true to the original books. When I have become too entangled in religiosity and strict, tidy, clean-cut, right-wing versions of Jesus, the picture of Aslan presented through these stories is what I always fall back on. Like The Shack, below, this is the Jesus I know, who I have experienced and who I trust absolutely. The stories themselves are remarkable and full of delight, but Lewis’ theology and Christology comes through with such clarity and hope and that is what continues to move and shape my soul. In our first year of marriage, we have read 6 of the 7 books aloud, mainly because I wanted him to be able to picture what faith and Jesus look like to me. The Shack by Paul Young caused reverberations and waves across Christian culture and warm tides of relief and joy in my heart. Seriously. This book is crazy and a bit out there, but I love the God portrayed here. Love. And I need to fall in love with God, again and again. My fiancé (now husband) and I read this together during our engagement (his first time reading it, my second) and it inspired so many conversations, moved us both deeper into our spiritual relationship with each other and, I hope, increasingly deeper with God/Father/Mother/Son/Holy Spirit as well. Take This Bread by Sara Miles shook me deeply. If The Shack shook and shattered my preconceptions of God’s identity and interaction with me, Take This Bread took that shaking up several steps further and destroyed my preconceptions of God’s interaction with everyone else. And I loved it. I read this for the first time at the beginning of 2012, which is kind of funny because looking back, this whole year has been circling around the theme of embrace and acceptance. Not coincidental, then, that Miles’ memoir/treatise challenged me to embrace a God who fully loves and unconditionally accepts…everyone. Wow. I still am stunned at how crazy that is. This makes me want to reread every one of these. This entry was posted in Growing up and tagged books, Reflection. Bookmark the permalink. ← (12) what is saving your life right now?